Countries are often defined by their rivers. Germany and the Danube, the United States and the Mississippi, North Africa and the Nile, the Indochina community and the Mekong, and Thailand and the Chao Phraya. The economic and cultural development of these countries is defined by their relationship to their rivers and the cruising of Chao Phraya gives a magnificent port hole into the history and spirit of Thailand. 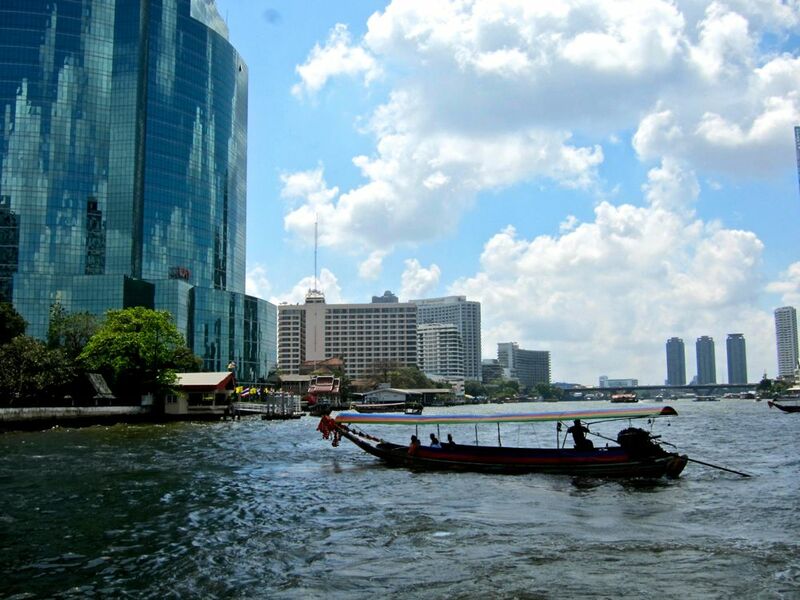 Most of us would only see the river in Bangkok where it has become the front seat of a stadium to watch brilliant architecture and a modern, bustling economy in constant flux. 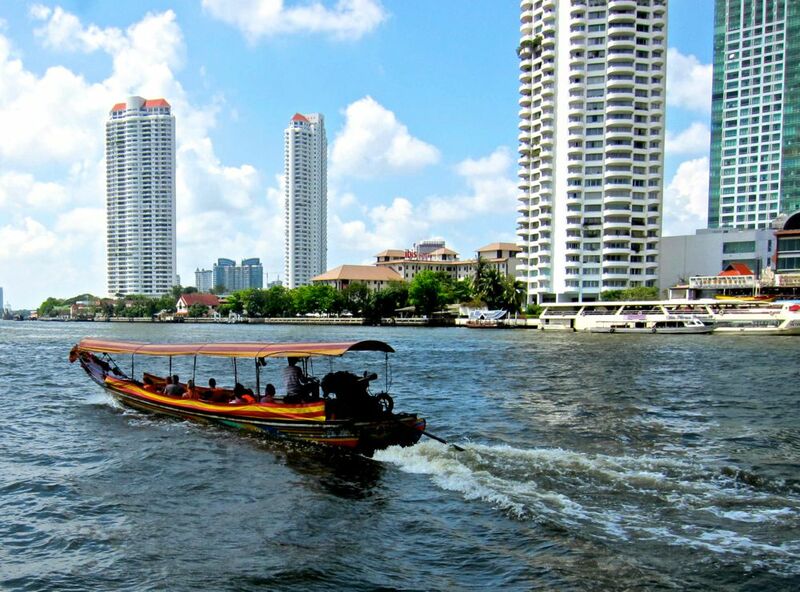 Outside of Bangkok, it stays an eternal river with little change and there is still the smell and feel of old Asia. So armed with our map, we took the sky train to Sathorn-Thaksin where the Central Pier in Bangkok was located. Upon arriving, the crowd was already moving towards the Pier so it was not a challenge to find it. This was the Sunday following Chinese New Year, so people were still in a festive mood. Families took station on board the boat to go shopping up-river, visit temples or just have a breath of fresh air with new vistas. Once ticketed and underway, my husband took on his Hornblower image and scanned the water for the immense barges that used to ply the river. The Boathouse for the Royal barges was just ahead and the long tail boats needed his careful Admiralty direction. I looked for the familiar hotels we stayed in along the river, the Riverside shopping mall and the frantic canal entrances and the familiar scenes of 3 decades we have visited and worked here. Little did I know that the river would give me a whole new perspective on the development that has mushroomed over that time . Over the years we had been in the city mostly for meetings and after all the tourist hits were done in the mid ‘80s, we had not really gone out to the river. In the past, our route always brought us to take the boat to Ayutthaya, and for the past 20 years, we had even not done that. I was amazed at the variety and mass of the buildings that have erupted along the shore. No carefully planned Singapore this! A true chaos of energy. So many hotels on the riverside have their own work boats now and, of course, with all the world visiting Bangkok, more boats for the tourists as well. You can go on these boats from the hotel if you are a guest or rent a boat for the day so the river is extremely busy. When we arrived at our destination, we thought we would do a bit of shopping after a drink in one of the many restaurants in the area. But because we wanted to watch the action on the river, so we chose a restaurant that was right on the water. 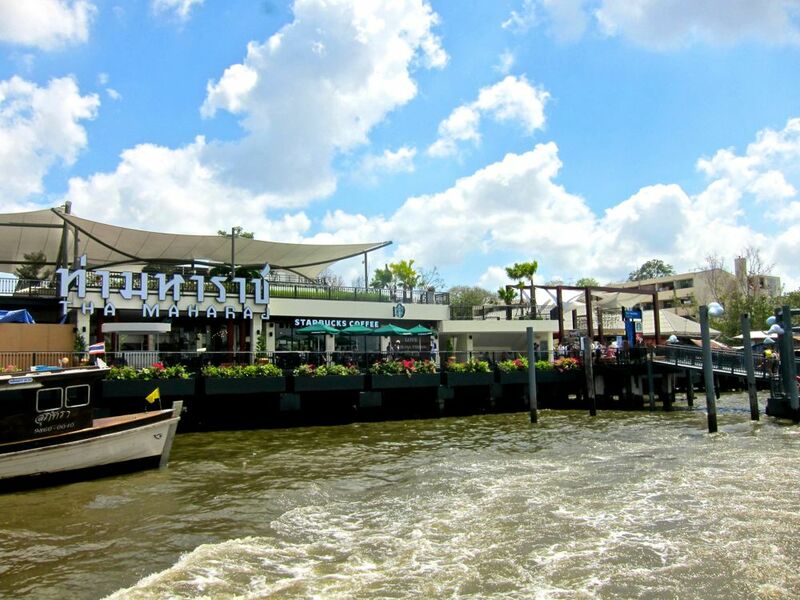 The servers were so attentive, we ended up staying for lunch and just idling our time watching while we fell back into the timeless rhythm of the river as you move out of Bangkok. After a languid and liquid lunch, we had lost interest in shopping and took the first boat that arrived to get home. It was not supposed to be our boat. It was more for Thais avoiding the crazy traffic by shuttling on the river. One tiny mini mouse boat staffer with a Goliath of a voice suggested…frequently..at stentorian levels, that we exit. Hornblower stood his ground puffing importantly. The boat was jam packed and so crowded that some passengers lost their patience and got into a fist fight. That was immediately taken care of as the adversaries disembarked at the next landing, prodded by the magnificent vocals of our mini mouse in high dudgeon. We were forgotten, and cruised on home. 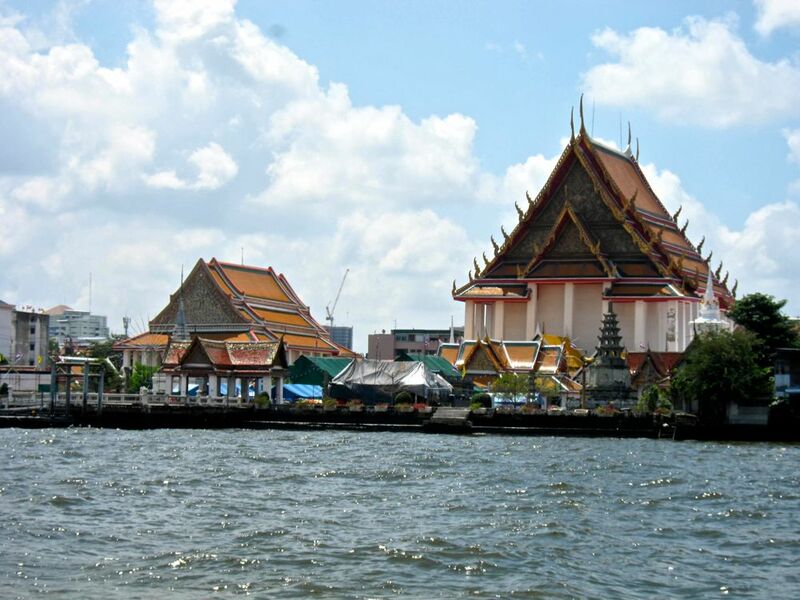 The Chao Phraya never stops throwing up incredible images and you can stop at many of the piers and visit tiny markets, huge temples, ancient building and serious and seafood restaurants places. 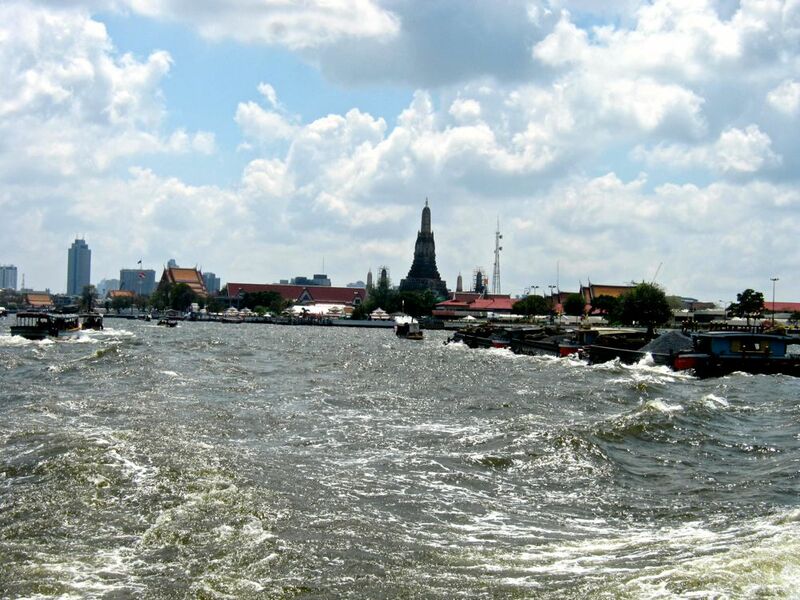 Two of the most interesting is sites are the Wat Arun or the Temple of Dawn and the Flower Market. The piers are all comfortably serviced with all kinds…and prices.. of restaurants. We were fortunate to be in large water taxis filled with both tourists facing outwards and locals going to and from work , with the teen age cell phone stare or grazing anewspaper or bantering with work companions. The dozen kilometres of the water front tells the story of the destructive chaos caused by creating a modern city but leaves enough memories to let you peek back at history. You can get a boat ticket for the day costing 150 baht ($5). Or, just get the tourist boat for 40 baht one way. The boats start at 9 in the morning and end at 7 p.m. So you can go to all kinds of tourist sites using the boat……. much more fun than the grind of the mini bus. It's a different view of Bangkok.